Scott has served at the Colorado Youth Corps Association since 2011, and as Executive Director since 2014. His work has concentrated in expanding the investment in youth and conservation corps as a solution to the myriad of issues facing Colorado’s iconic natural resources. He directed CYCA’s recent 5-year strategic planning effort (2018-2022) that strives for an increase in inclusiveness and diversity in the corps sector and raising the profile of corps with a broader audience in Colorado. 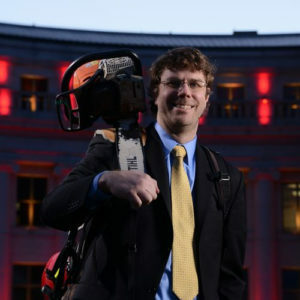 Prior to joining CYCA, Scott was the Director of the Conservation Corps at Rocky Mountain Youth Corps in Steamboat where he directed their flagship conservation program, overseeing more than 120 members each year deployed across northwest Colorado. His career in the corps sector began in 2002 as an assistant trail crew leader of high school students on four-week sessions, and in subsequent years led backcountry crews building the Continental Divide Trail and an all-Navajo forest thinning crew in Utah’s canyonlands. A former wilderness ranger and wildland firefighter with the US Forest Service, he is a graduate of Roanoke College, where he earned a B.A. degree in English, and the University of Denver’s 2017 Daniels School of Business Leadership program. Scott is a recipient of the 2018 Governor’s Service Awards for Outstanding Community Leader, and was honored as one of Roanoke College’s most outstanding alumni of their first 175 years. Scott explores Colorado’s public lands as much as possible, particularly birdwatching and wildlife photography of elusive owls. On his return trips back home to the east coast, one priority is to continue to explore the hidden corners of the Blue Ridge Valley in Appalachia. He is also a Rockies season ticketholder but remains conflicted when his hometown Phillies come through town every year.